When? Friday June 28, 2019 9:30am-1:30pm at the Justice Complex, 1 Jackson Drive Jackson, NJ 08527.
Who Can Attend? All high school kickers, punters and long-snappers. Beginners welcome, college coaches showcase is optional. Costs? $215 by June 14, $240 after. 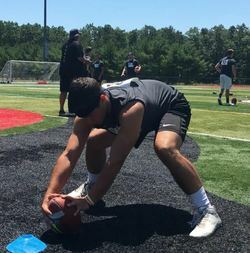 About the Event: Hosted by Special Teams Solutions, the Shore’s Best Specialist Camp and College Showcase features some of the finest specialty coaches in the country. 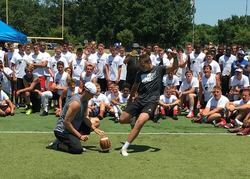 Current and former Division I and NFL specialists will provide great instruction, competition and direct exposure to numerous NCAA college coaches at camp. Click here for video highlights! Schedule: 9:30am Check-In, 9:45am Instruction, 11:30am Lunch/Film Review, 12pm Showcase, 1pm Recruiting Seminar, 1:30pm Conclusion. What to Bring: two footballs, tees, mechanical holder, water and lunch.